STEVE LEWIS/Durango Herald - John Harper of the Durango & Silverton Narrow Gauge Railroad & Museum said spark arresters, which employ a screen and small water nozzles on the stacks of the steam engines, reduce the chances of hot cinders escaping and starting fires. Engine watchman Robin Schanbarger looks over a train returning to the station on Friday evening. STEVE LEWIS/Durango Herald - Hugh Tracy waits for a train on Saturday morning in Hermosa. STEVE LEWIS/Durango Herald - Patrick Welch, left, Hugh Tracy, center, and Kryn Dykema hook up a water tank to a pop car on Saturday morning in Hermosa. STEVE LEWIS/Durango Herald - Robert Manore, left, and Hugh Tracy of the Durango & Silverton Narrow Gauge Railroad look for signs of fire while traveling in a gang car behind one of the trains making the trip to Silverton on Saturday morning. Manore said the gang car and another smaller pop car carry water tanks, fire fighting tools, hoses and pumps to extinguish potential fires caused by the coal-fired steam engines. Manore said there are also two 7,000 gallon tank cars at their disposal and a helicopter with a water bucket that patrols the tracks all the way to Silverton. STEVE LEWIS/Durango Herald - If our guys miss anything on the ground, our helicopter will see it, said Al Harper, owner of the Durango & Silverton Narrow Gauge Railroad & Museum. Pilot Greg Harral of New Air Helicopters, said he flies the entire length of the railroad from Durango to Silverton twice a day during the height of the fire season looking for signs of fire. STEVE LEWIS/Durango Herald - John Harper, left, and Hugh Tracy prepare to follow one of the trains to Silverton on Saturday morning in Hermosa. STEVE LEWIS/Durango Herald - Operator Kryn Dykema checks one of the portable metal water tanks on Saturday morning in Hermosa. STEVE LEWIS/Durango Herald - John Harper of the Durango & Silverton Narrow Gauge Railroad works next to one of the two large water cars used for fighting fires along the railroad tracks on Friday evening at Rockwood. STEVE LEWIS/Durango Herald - A pop car outfitted with a water tank follows one of the Durango & Silverton Narrow Gauge Railroad trains on its journey back to Durango from Silverton on Friday afternoon. STEVE LEWIS/Durango Herald - Josh Levine tops off one of the water tanks on Saturday morning in Hermosa. At right is Patrick Welch. STEVE LEWIS/Durango Herald - Fire lines are created wherever possible along the route to Silverton to stem the growth of any possible fires created by the coal-powered steam engines, according to Robert Manore, roadmaster for the Durango & Silverton Narrow Gauge Railroad. STEVE LEWIS/Durango Herald - Patrick Welch, left, and Kryn Dykema follow one of the trains up to Silverton on Saturday morning in Hermosa. STEVE LEWIS/Durango Herald - Patrolman Rod Vallejos of the Durango & Silverton Narrow Gauge Railroad follows one of the trains, keeping an eye out for fires, in a pop car outfitted with a water tank on Saturday morning. A larger gang car with three firefighters with additional water, fire retardant and suppressant, a water pump, and other firefighting equipment, also follows each train, according to John Harper, business development officer for D&SNGRR. Despite red-flag warnings, the Durango & Silverton Narrow Gauge Railroad continues to run coal-fired engines to Silverton. But railroad officials said they have taken several precautions to reduce the threat of wildfire that so far have been successful. Weve covered every base that we can think of, and hopefully it alleviates concerns for people, said railroad spokeswoman Andrea Seid. The railroad suspended service to Silverton for three weeks during the 2002 Missionary Ridge Fire, which burned 72,000 acres near Durango. It was the first time in its 120-year history that it shut down because of fire danger. At the time, railroad owner Al Harper vowed to make improvements to avoid a similar shutdown. Im going to be ready next time, he said in July 2002. The railroad this summer hired a helicopter to be on standby at Tall Timber, a resort about halfway between Durango and Silverton. The helicopter is equipped with a bucket to make water drops and flies the entire length of the track about two hours a day looking for potential starts, Seid said. A small pop car with one person on board pulls a 30-gallon tank of water behind each train looking for spot fires, she said. Behind that is a gang car equipped with 330 gallons of water that can assist the pop car, if needed, she said. A sprayer on the gang car can shoot water up to 400 feet, Seid said. It also is able to pump water from the river, she said. Each train has two 550-gallon water tanks with powerful pumps, she said. The railroad also has two tank cars with 7,000 gallons of water. One is parked at the Pinkerton siding near Hermosa Hill, and the other is near Rockwood. The railroad has 23 men who are trained to fight fires, Seid said. They can cover multiple fires, if that ever happened, she said. Hot cinders can escape from the engines smokestack and land on the dry, brittle ground, sparking a wildfire. Railroad workers usually are able to snuff these fires before they grow too large, but sometimes they slip away. In 2002, a D&SNG engine started a 556-acre fire between Cascade Wye and Needleton. To reduce spot fires, Harper installed mesh screens on the smokestacks to help block cinders from escaping. A circular ring at the top of the smokestacks also sprays a fine mist to help cool the emissions. The trains spark three to six small fires a day, but none have grown too big, said Paul Schranck, general manager for the D&SNG. The crews have been doing a great job, he said. Ridership has been 7 to 8 percent higher this year than it was last year, he said. Were doing really well, Schranck said. 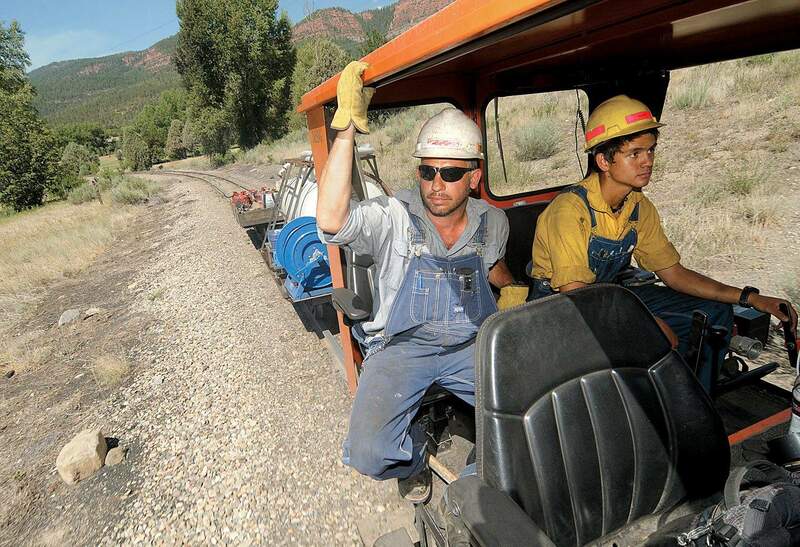 Robert Manore, left, and Hugh Tracy with Durango & Silverton Narrow Gauge Railroad look for signs of fire while traveling in a gang car behind one of the trains making the trip to Silverton. Manore said the gang car and another smaller pop car carry water tanks, firefighting tools, hoses and pumps to extinguish potential fires caused by the coal-fired steam engines. STEVE LEWIS/Durango Herald - DURANGO - 06/30/12 - Robert Manore, left, and Hugh Tracy of the Durango & Silverton Narrow Gauge Railroad look for signs of fire while traveling in a gang car behind one of the trains making the trip to Silverton on Saturday morning. Manore said the gang car and another smaller pop car carry water tanks, fire fighting tools, hoses and pumps to extinguish potential fires caused by the coal-fired steam engines. Manore said there are also two 7,000 gallon tank cars at their disposal and a helicopter with a water bucket that patrols the tracks all the way to Silverton.